Respondus Monitor is a new tool available to faculty at UIS who want to enhance the integrity of low-stakes exams in online classes. While Examity remains the recommended option for high-stakes exams like midterms and final exams because of its ability to provide live, real-time proctoring, Respondus Monitor is a good option for faculty members who want to improve the integrity of low-stakes exams like weekly quizzes. It uses a student’s webcam to record the testing environment. Suspicious testing behavior is automatically flagged by the software, and instructors are alerted to preview the alert flags. 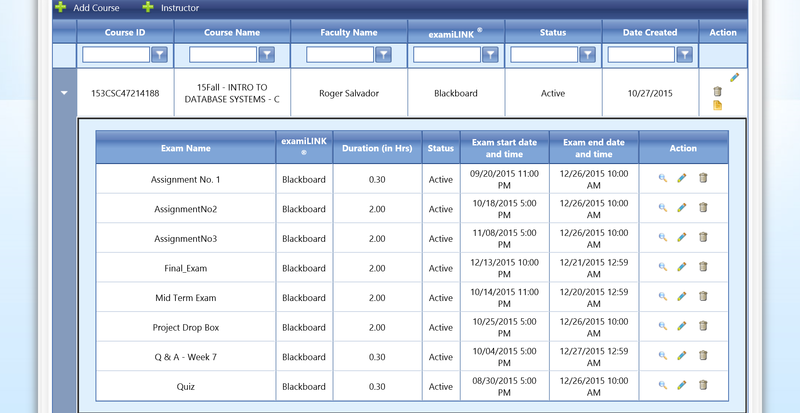 Respondus Monitor is free for faculty and students to use and it is integrated with Blackboard. Respondus LockDown Browser must be used to use Respondus Monitor. To use Respondus Monitor, follow the directions for using Respondus LockDown browser. After selecting Respondus LockDown browser, also select the Respondus Monitor option. To learn more about how to protect the integrity of low-stakes online exams, please visit Respondus Monitor’s Instructor Resources website. Use is not limited to papers – Can be used for discussion boards, essay exam questions, etc. Respondus LockDown Browser can help, but can be easily circumvented! Proctoring centers can be used, but are all of your online students getting equal testing environments? Not all proctors treat proctoring equally! How are we ensuring that the student is the one completing the exam? How are we authenticating our online students? Turnitin Feedback Studio is designed around empowering you and your students by giving you the information and the tools needed for an efficient submission and marking process. Turnitin has made improvements to accessibility, responsiveness, and navigation, all designed to help instructors build better writers, with an emphasis on integrity. This Instructor Guide offers video tutorials as well as written guidance for using Feedback Studio. When you deploy a test or survey to a content area, you set the availability and feedback options. 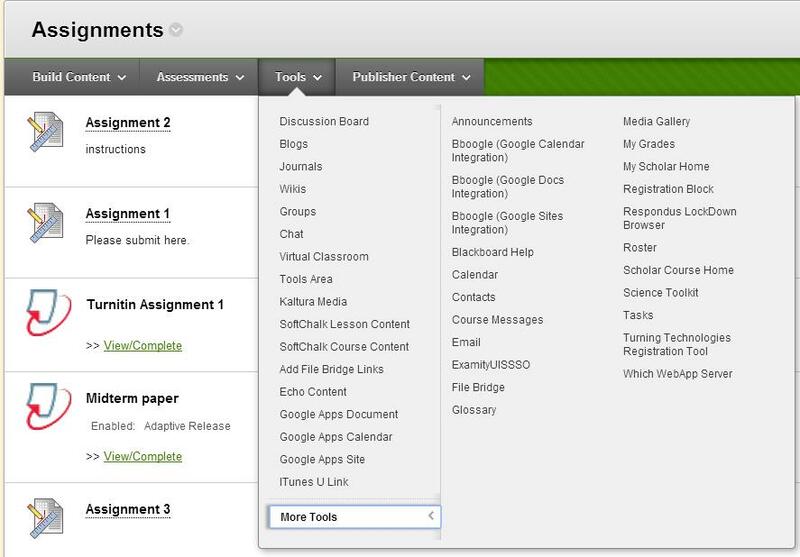 To make changes to the options, access its contextual menu and click Edit the Test Options or Edit the Survey Options. The following table provides descriptions of the test and survey availability options. Click the images to enlarge them in your browser. Use your browser’s back function to return to the topic. Make the Link Available You can set this to available, and then use the Display After and Display Until fields to limit the amount of time the link appears. Add a New Announcement for this Test/Survey You can create an announcement for a test or survey. The announcement includes the date and states, “An assessment has been made available in [Course area that includes the link to the assessment].”If an announcement was previously posted using this feature, the date and time of the most recent announcement appears. 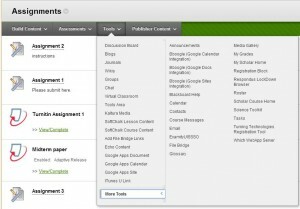 Multiple Attempts You can allow students to take a test or survey multiple times. The status of multiple attempts appears to students at the top of the test or survey. Select Allow Unlimited Attempts to allow students to take it as many times as they want. Select Number of Attempts and provide the amount of attempts.With multiple attempts for a test, you can also select which attempt’s score to use in the Grade Center from the Score attempts using drop-down list. Force Completion If you select Force Completion, students must complete the test or survey when they launch it.Students may only access the test or survey ONE TIME. The Save function is available for students to save the questions as they work through them, but they may not exit and reenter the test or survey. In the instructions, Force Completion is noted and explained to students. If you do not enable Force Completion, students may save their progress, navigate away, and return to complete the test or survey.If students accidentally close their browsers, leave the test or survey page, or lose power or their internet connections, they cannot continue. They must contact you to allow them to start over with a new attempt. You may want to reserve the Force Completion option for when students are on campus taking a proctored test and connected to an Ethernet cable instead of Wi-Fi. If issues occur, an instructor can be available to reset the test. Alternatively, use the Set Timer options to reduce receiving emails from panicked students who accidentally left a test or survey with Force Completion enabled. 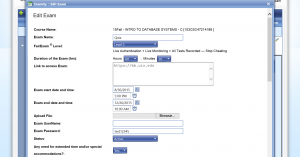 Set Timer Set a time limit for finishing a test or survey. Type the amount of time in the hours and minutes boxes. During a timed test, the time elapsed is displayed to students. As students approach the time limit, a one-minute warning appears.When an attempt is complete, student completion time is available in the Test Informationsection. If a student saves and exits the test, the timer continues. For example, if he begins the test on Tuesday, saves and exits it, then completes it on Thursday, his completion time will be 48 hours. If you set the timer, turn on Auto-Submit to automatically save and submit a test or survey when time expires. Without enabling auto-submit, students have the option to continue after time expires. Tests and surveys are flagged as submitted after the timer expired. You have the option to adjust the grade based on the time. You may find it advantageous to use the Set Timer options and not the Force Completion option. For example, if a student loses his internet connection for 10 minutes on a timed test, at least he can access the test again and continue. If you enabled the Forced Completion option, he cannot access the test again and must contact you to reset the test. Display After Optionally, select the date and time when the test or survey will become available to students. You can control availability through the Make the Link Available option without setting specific dates. Display Until Optionally, select the date and time the test or survey will be made unavailable to students. Password You can require and type a password for students to use to access a test or survey. Passwords have a limit of 15 characters and are case sensitive. Restrict Location You can require students to take the test or survey in a specific location. Students outside of this location are not able to take the test or survey. This is based on a range of IP addresses created by your institution. If your institution has not created this range, this option does not appear. To learn more, see Restrict Tests by Location. Test Availability Exceptions For existing availability settings, you can make exceptions for individual students or groups. Use exceptions to provide an accommodation to a student who is disabled, or for technology and language differences. For a test with one attempt, you can allow more attempts for a student who is blind and using screen reader technology for the first time. Due Date If you use grading periods in the Grade Center, set a due date to easily include that test or survey in a grading period and on the calendar in the My Blackboard menu. To prevent late submissions, you can select the check box for Do not allow students to start the Test/Survey if the due date has passed. Students receive a message after the due date, notifying them that the test or survey can no longer be completed. Include this Test in Grade Center Score Calculations You can include this test in Grade Center calculations. If the test is not included, the score does not affect any Grade Center calculations. Hide Results for this Test Completely from Instructor and the Grade Center You can hide this test score from you and exclude it from Grade Center calculations. The display in the Grade Center will read Complete/Incomplete and N/A or zero appears on the Grade Details page. You cannot see students’ answers to questions. Students are able to view their own scores.Selecting this option makes Include this Column in Other Grade Center Calculations and Show Statistics (average and median) for this Column to Students in My Grades unavailable when editing column information in the Grade Center. Turnitin is plagiarism detection software available to faculty at UIS. To learn more about using Turnitin as a student, including helpful videos, please see http://www.uis.edu/colrs/students/turnitin/. 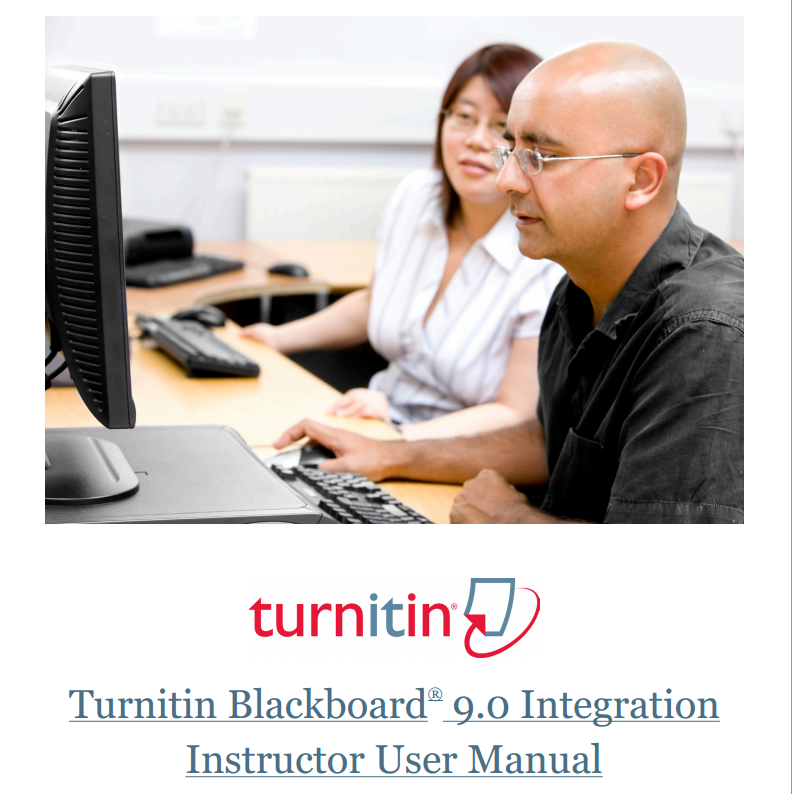 You may also find the Turnitin Manual for Students (pdf) a helpful resource. Whether it is to spot check for suspected plagiarism or submit an assignment for a student with computer problems, instructors may submit a student file to a Turnitin Assignment they have created in their Blackboard course site. Go to the Blackboard course that contains the Turnitin Assignment. Go to Control Panel > Course Tools > Turnitin Assignment. Select the student’s name from the “Author” drop down list. Enter a title for the paper. Click on “Choose from this computer” button to upload the file, and the find and select the student’s paper. Once the paper has been submitted, you will see the Turnitin Digital Receipt. Click on “go to inbox” to see the listing of papers submitted for this Turnitin Assignment. Watch a video on how to submit a student paper to a Turnitin Assignment in Blackboard. Download the UIS Examity Quick Guide for Faculty. 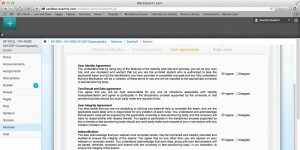 You will access Examity® through Blackboard. All of the data relevant to your exams will be imported automatically daily into Examity®, and Examity® will not change anything about the way you currently use Blackboard. To use Examity in your class, you must first turn the tool on your course. To turn the tool on, click on Customization in the Control Panel and select Tool Availability. 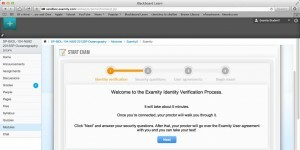 On the Tool Available page, you will need to put a checkmark in the box for ExamityUISSSO. You can then add a link to Examity in your course. In the content area in which you want the link to appear, click on Tools –> More Tools –> ExamityUISSSO. Click submit. 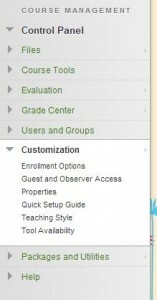 This will add a link to the Examity dashboard inside your course. To get to your Examity® Dashboard, click on the Examity® link. 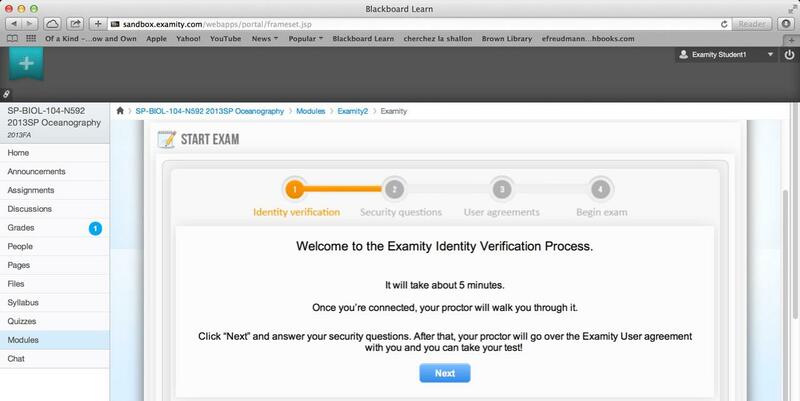 You will see a screen that says “click here to login”—by clicking that button, you log into Examity® with your Blackboard user infor­mation. Once you click it, you will be taken directly to your Examity® Instructor Dashboard. You may be prompted to login as an Exam Instructor or Student. Select Exam Instructor. Please note: there may be a one-day delay in seeing your dashboard after enabling the Examity tool for your class, as the data link between Blackboard and Examity refreshes once per day. You can get to all four areas of Examity® from your dashboard by clicking on either the links at the top of the navigation bar or the icons you see when you log in. Clicking on the EXAM STATUS button will enable you to see the status of your students’ exams (scheduled, pending at auditor, approved/rejected by auditor, or cancelled/incomplete). This is the button to click if you want to review videos once they have been approved by our auditing team. 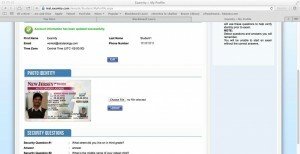 Clicking on STUDENT enables you to search for individual students. If a student needs special accommodations for an exam, such as double time for the exam, that information may be entered here. 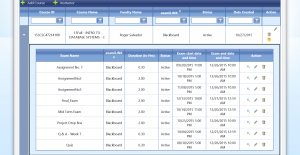 Clicking on the REPORTS button displays all the exams that are associated with you. You can filter by class, or student name, and download Excel and PDF versions of these reports to help you keep track of your students. Clicking on COURSES/EXAMS takes you to a list of all your classes. You can edit courses here. Please Note: The first time you visit Examity, you will need to set up your profile. It is important for you to set up your correct time zone so that Examity knows from what time zone you are teaching. 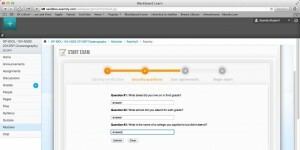 The first step in setting up an exam with Examity is to make sure the exam is set to available in Blackboard. The exam should also have a password. Exams that are made available will be directly imported into our system. Once an exam has been imported, you can enter the Examity dashboard and edit the settings of each course and exam by clicking the pencil icon under the “Action” tab. 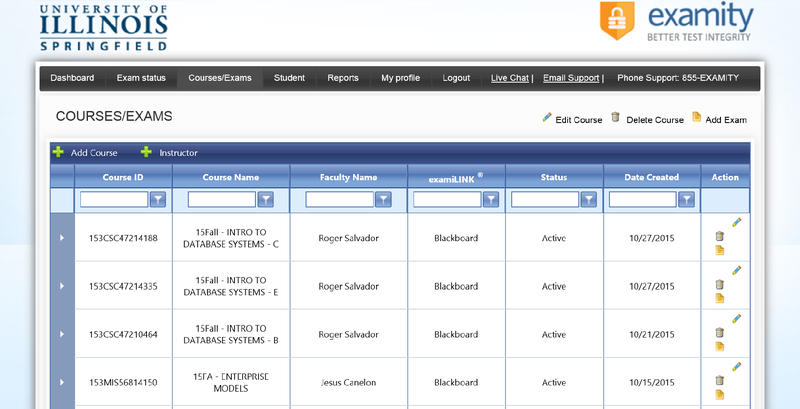 Click the arrow left of the course name to find and edit each exam for that course. Exam Name: Midterm, Quiz 1, etc. FairExam Level: this is the desired level of proctoring service required. Examity offers four levels of service. As the instructor, you can select which level of service you want for your exam. Exam Password: If your Blackboard exam has a password, you may share the password with the proctor here. He/she will enter the password for the student on Blackboard. Extended Time/Special Accommodations: If you have a student who needs special accommodations for the exam, select Yes. Please note: after setting up your exam, you will need to select the student(s) who needs special accommodations in the Student section of the Dashboard and enter the details of the student’s accommodation. Student Upload File: If your students need to upload a file when they finish their exam, select yes. The second part of the box establishes the rules for the exam environment. You can add special instructions here. Examity provides standard rules, as listed above. To insert customized rules, such as the test is open book or that students are permitted to use a calculator, you may add them here by clicking the checkbox. Additional rules and special instructions may be inserted in the text box (click save after entering). Click Save Exam to finalize the exam’s arrangements with Examity. Once you have added an exam, you can see the arrangements and make changes by clicking on the arrow next to the course in your Courses/Exam section of your Examity Dashboard. Once an exam has been arranged with Examity, students may begin scheduling their exams directly with Examity. A sample letter for faculty to send to students about the scheduling their exam with Examity can be found on the COLRS’ website at go.uis.edu/examityemail . **Please note: Exams will be pulled in automatically within 24 hours once the “Make the Link Available” link in Blackboard is marked to yes. To prevent students from seeing the exam before the exam date, set the Display After and Display Until dates for the testing period. The Exam Status section of the Examity Dashboard allows instructors to view whether students have scheduled their exams and when those exams will take place. If a student has completed an exam, the status of the exam will indicate what stage the exam is currently in (in progress, pending at auditor, approved by auditor). If the exam has been approved by the auditor, you will see at least two alert flags. Green flags indicate no violations. If a student is authenticated and completes the exam with no violations, he/she will have two green alert flags. Yellow flags indicate possible violations. These suggest that a violation of the rules has occurred, but the student was likely not cheating. For example, if the students’ young child runs into the room during the exam session, the auditor will flag the violation with a yellow flag. Red flags indicate violation. A violation of the exam rules has occurred. When a student receives a red flag violation, the instructor will also receive an e-mail about the incident. Instructors can view details of the alerts and watch the exam video by clicking on the View link next to the students’ flag alerts. Videos will remain available for 30 days, after which it is deleted from the Examity system. Support is available 24 hours a day. Download the UIS Examity Quick Guide for Students. 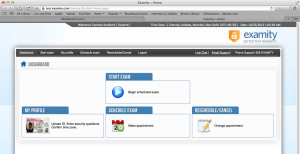 You can access Examity® through your course on Blackboard. Click on the ExamityUISSSO link within the course. Click to login to Examity. This will take you to your Examity dashboard. From here you can edit your profile, schedule exams, and make changes if you need to cancel or change a test time. Most importantly, this is where you’ll go to start your exams. Setting Up Your Profile: To get started, update your Examity® profile by clicking in the My Profile section of the Dashboard. You will need to upload a picture of your UIS Student ID or a government issued photo ID, select your time zone, and set your security questions. Please note the importance of selecting the correct time zone. This will be used in scheduling your test with the proctoring center. You can confirm your selected time zone by looking at the time in the upper right hand corner. Once you have set up your profile, you can bypass this step for future exams. 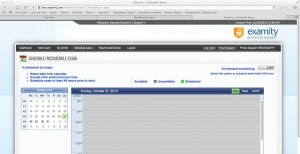 Scheduling Your Exam: When you are ready to schedule an exam, click “Schedule Exam” on your dashboard or on the top navigation bar. You will see a calendar. If you are scheduling your test more than 24 hours in advance, you can just select the date and time you want. If you are scheduling it less than 24 hours in advance, make sure the on-demand scheduling option is enabled in the top right-hand side of the screen. Paying for Exam Proctoring: You will pay for your exam proctoring session at the time you schedule the exam. Rates for the proctoring session vary based on the length of the exam and the level of proctoring service selected by the instructor. Additional fees apply if you use on-demand scheduling (exam occurs within 24 hours). Rescheduling or Canceling Your Exam: If you need to change or cancel your test appointment, click Reschedule/Cancel, and select the exam you want to change from the menu that appears. To take your exam, make sure you have your webcam and microphone set-up on your computer. 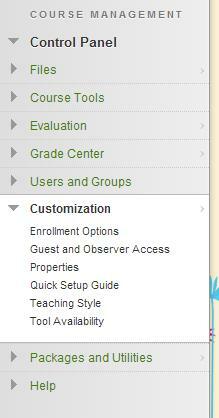 Sign into Blackboard, then your class. 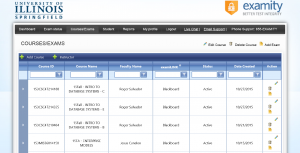 Return to the Examity® Dashboard by clicking on the ExamityUISSSO sign-on link within your class. 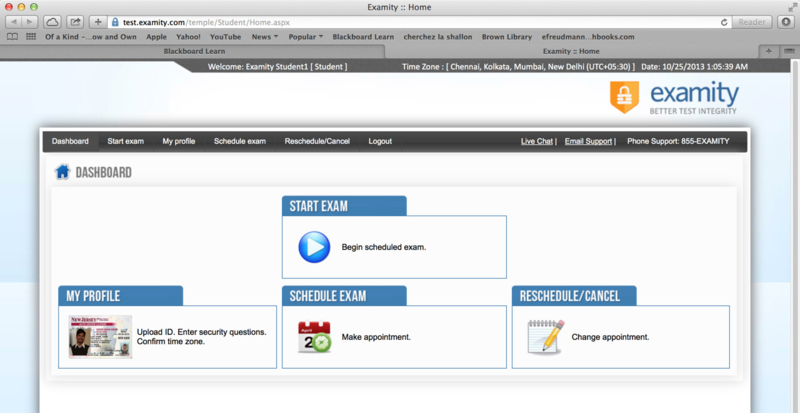 Once on the Examity dashboard, click “Begin Scheduled Exam”, and select your exam. You will then be connected to your proctor. Note: MAKE SURE YOUR POP-UP BLOCKER IS DISABLED otherwise you will not be able to connect with your proctor! Your proctor will walk you through the test authentication process, which will include verifying your identity, going over the exam rules, scanning your work area and desk, answering your security questions, and agreeing to the User Agreement. 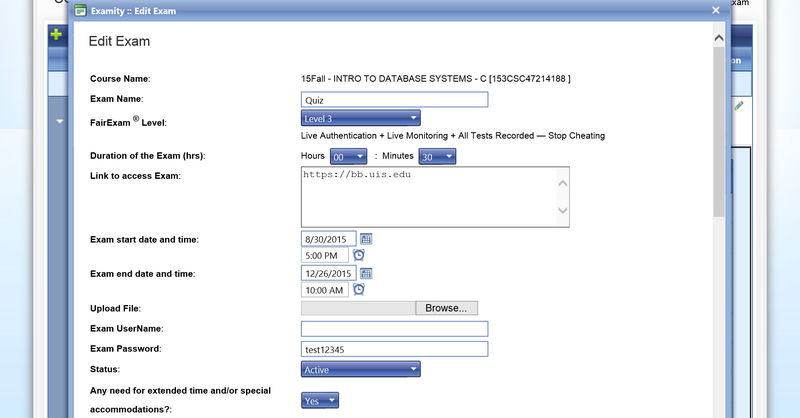 Once you have finished the authentication process, you will see a screen that says “Begin Exam”, and your exam will open. If your test is password protected, your proctor will tell you the password when the prompt to enter it appears. Click on the Assessments button and select Test. Click on the name of the test you wish to deploy and click OK.
On the “Test Options” page that appears, you will select how and when your students will view the test. Under “1. Test Information,” you will see the information you entered while creating the test. The description will appear beneath the link to the test in your content area. Make the Link Available. Select “Yes.” You can limit the availability of the test using the Display After/Until tool below. If you choose “No” students will not be able to view the exam. Add a New Announcement for this Test. Select “Yes” to have Blackboard post an announcement that the test is available. Multiple Attempts. If you would like students to have more than one attempt at the test, check the box for multiple attempts. Select either “Unlimited Attepmts” or “Numbers of Attempts.” If you choose “Number of attempts,” enter the specific number of times you would like your students to be able to attempt the test. Force Completion. If you would like to force students to complete the test the first time they launch (click on) the test, select this option. Set Timer. The timer in Blackboard does not close the exam if a student exceeds the time limit. It simply sets an expected completion time and records the length of time each student spends in the exam. Instructors can view this information in the Grade Center column for the test. To set the timer, check the “Set Timer” checkbox and enter the time in hours and minutes. Display After. Check the box and enter the date and time that the test should become available to students. If the box is not checked, the dates and times will not be saved. Display Until. Check the box and enter the date and time that the test should no longer be available to students. If the box is not checked, the dates and times will not be saved. Password. If you wish to have students enter a password to access the exam, check the box and enter the case-sensitive password. This tool is especially useful when proctoring exams or giving make-up exams for specific students. Under “3. Self-assessment Options,” instructors choose how the test results are recorded. Include this Test in the Grade Center Score Calculations. This option is turned on by default. If you do not wish for the test to count toward student total grades, uncheck the box. Hide Results for this Test Completely from Instructor in Grade Center. If checked, this option hides all student scores from instructors. This information cannot be recovered by instructors, ITS or COLRS. Please do NOT check this option. Under “4. Test Feedback,” select the feedback you wish students to see after they complete the test: Score, Submitted Answers, Correct Answers, and/or Feedback. Unchecking all boxes until the testing period ends is a common practice. Instructors may edit the feedback option after students are finished taking the test or grading is complete. Under “5. Test Presentation,” instructors choose how a test is displayed to students. All at Once. All questions are displayed on a single screen. This is a good option if your test includes fewer than 20 twenty multiple choice or true/false questions. If your test includes more questions or any essay questions, please consider presenting your test with the “one at a time” option. One at a Time. If your test contains more than 20 questions or any essay questions, please select the “one at a time” option. This option forces students to click a “next” button to submit their work as they move through the exam. It can help prevent browser timeout issues. When “one at a time” questions presentation is selected, instructors can choose to Prohibit Backtracking, which that students see each question only once. Students cannot access questions they have previously submitted or change their answers. Randomize Questions. Students will see questions in a different order each time they attempt a test. Watch a video on how to access the Turnitin Assignment Inbox. Click on the Turnitin Assignment you wish to view or grade to go to the inbox for that assignment. To view the originality report (sources that match your student’s paper), click on the colored bar in the Similarity column. To grade the assignment click on the bubble icon in the Grade column. The Internet has perpetuated the age old problem of plagiarism. Turnitin can assist faculty in detecting and preventing plagiarism. It is also an excellent assignment collection, grading, and feedback tool, and can be used as an online collaborative learning tool where students can get feedback from their classmates. View a video overview of Turnitin. Quickly and conveniently identify how much material in a student’s paper is available on the Internet. Deter students who may otherwise be tempted to use sources inappropriately. Address the issue of proper citation of sources in a paper. Pick up tips for writing assignments that discourage plagiarism and encourage independent thought. 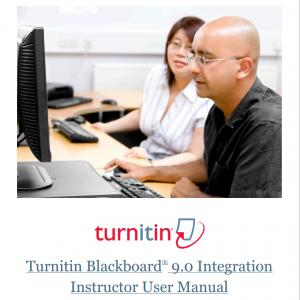 Turnitin is an available tool within Blackboard. The ‘Turnitin Assignments’ link can be found under the Course Tools section of the Control Panel. If that link is not there, you will need to add the Turnitin tool to your course by clicking on ‘Tool Availability’ under the Customization section of the Control Panel. Some UIS instructors may require proctored exams. When a UIS online student needs to take an exam, he or she will be required to make arrangements in advance for the exam to be proctored (supervised). 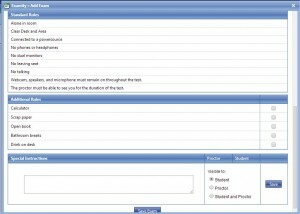 COLRS offers some forms that may be helpful for instructors and students in arranging for proctors. Please see the Online Teaching at UIS: Proctored Exams page for more information.